The marginal propensity to consume (MPC) measures the proportion of extra income that is spent on consumption. For example, if an individual gains an extra £10, and spends £7.50, then the marginal propensity to consume will be £7.5/10 = 0.75. The MPC will invariably be between 0 and 1. Income levels. At low-income levels, an increase in income is likely to see a high marginal propensity to consume; this is because people on low incomes have many goods/services they need to buy. However, at higher income levels, people tend to have a greater preference to save because they have most goods they need already. Temporary/permanent. If people receive a bonus, then they may be more inclined to save this temporary rise in income. However, if they gain a permanent increase in income, they may have greater confidence to spend it. Interest rates. A higher interest rate may encourage saving rather than consumption; however, the effect is fairly limited because higher interest rates also increase income from saving, reducing the need to save. Consumer confidence. If confidence is high, this will encourage people to spend. If people are pessimistic (e.g. expect unemployment/recession) then they will tend to delay spending decisions and there will be a low MPC. It is possible that consumers could have a marginal propensity to consume of greater than. If income increases £10, in certain circumstances, they may increase spending by £11 – they finance this extra spending by borrowing. More likely is a fall in income of £10, doesn’t cause a fall in spending because people need to maintain certain spending patterns (known as autonomous consumption). If a worker gains an extra £100, what will be the marginal propensity to consume on UK goods? These three withdrawals can limit the marginal propensity to consume. The multiplier effect states that an injection into the circular flow (e.g. government spending or investment) can lead to a bigger final increase in real GDP. This is because the initial injection leads to knock on effects and further rounds of spending. The marginal propensity to consume will determine the size of the multiplier. The higher the MPC, the greater the multiplier effect will be. If the marginal propensity to consume is 0, there will be no multiplier effect. 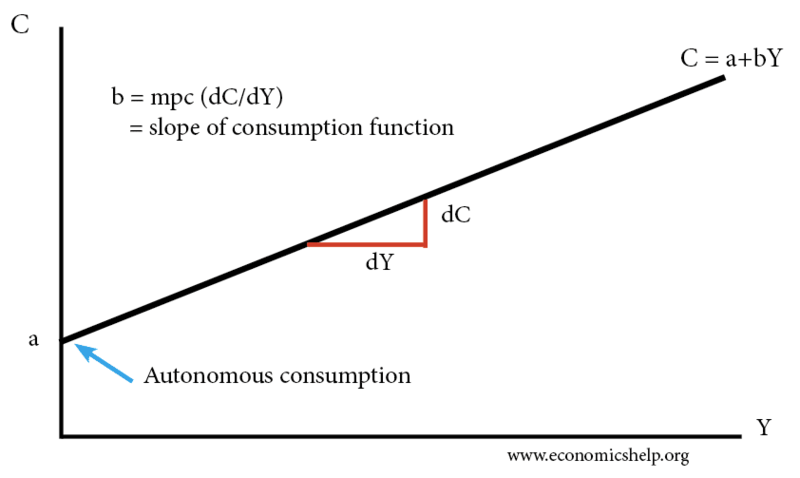 For example, if the government pursues expansionary fiscal policy (higher G) but consumer confidence is very low, then there will be a high propensity to save and a low marginal propensity to consume; this will limit the effectiveness of fiscal policy because the injection will lead to only limited increases in spending and aggregate demand. One important issue regarding MPC is the impact of tax cuts. If the government wished to pursue expansionary fiscal policy, they may cut the higher rate of income tax (45% on income over £150,000). However, the mpc is likely to be low at this income level. However, if the income tax threshold is increased, there is likely to be a greater economic stimulus because, at those income levels, the MPC is higher. The marginal propensity to save (MPS) = the amount of extra income that is saved. In a closed economy (without taxes). The mpc + mps = 1.